With the onset of this oppressive heat many of our landscape plants show signs of stress. Others thrive in it. Lantana is one woody perennial that can’t seem to get enough heat. I’ve seen it flourish when crabgrass and wiregrass wither. Lantana does more than tolerate heat. This profuse bloomer is a great butterfly attractant. Ruby throated hummingbirds love them too. Most types are winter hardy in eastern North Carolina. They also provide us with healthy color when thermometers register around triple digits. Flowers and foliage vary in their fragrance. Some have a sweet citrusy smell and others are not as pleasant. I have a large vigorous specimen that reaches over seven feet with gorgeous pink and yellow flowers. However, its crushed leaves smell like cat urine. 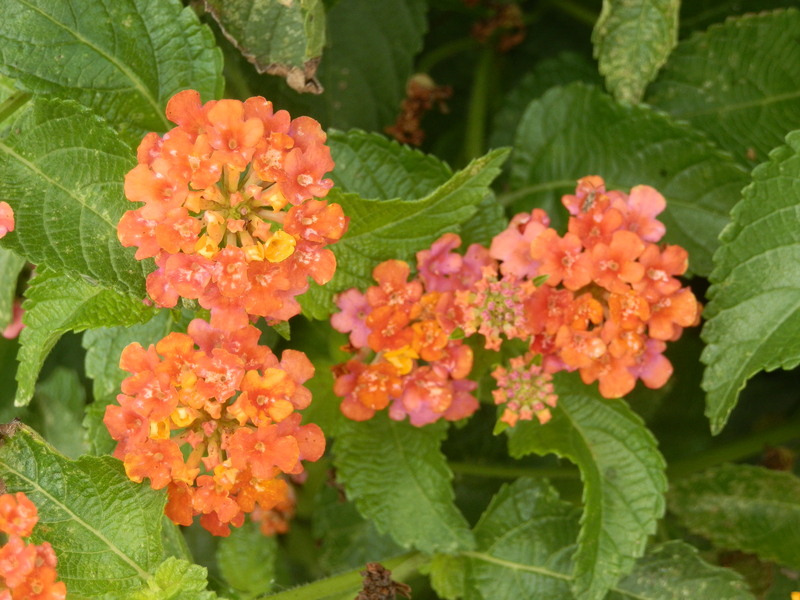 Lantanas come in many sizes, colors, and growth habits. There are low spreading types, like the bright yellow ‘New Gold’ cultivar. More upright and less spreading ones like the multicolored ‘Sonset’ and taller bolder specimens with a rainbow of colors, such as ‘Miss Huff’, which can grow six feet tall and spread even more adorn our landscapes. All lantanas love full sun. They can grow in a somewhat shaded environment but won’t bloom as much. There is also significant variation in winter hardiness, especially in areas that may be wet for long periods when plants are dormant. 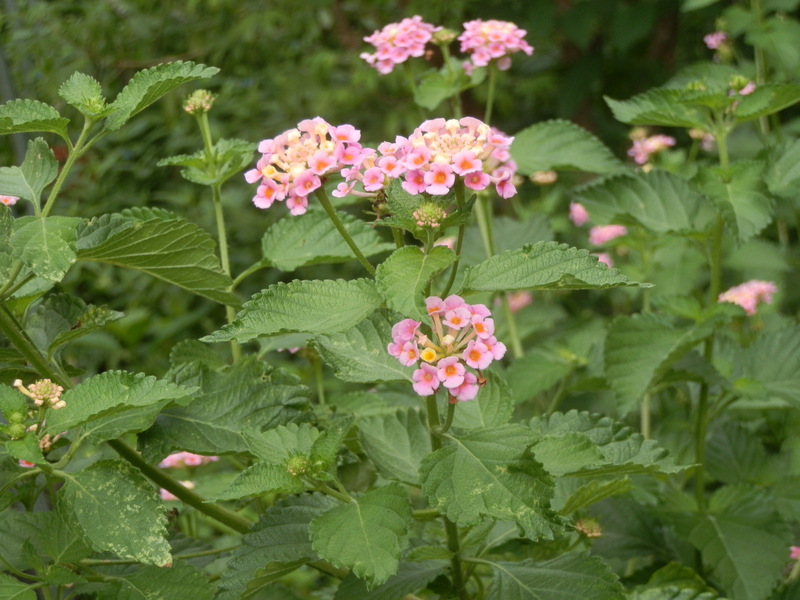 Lantanas are one of the last perennials to break dormancy in spring. Often buds don’t begin to shoot out of the crowns until almost mid May. Once warm weather comes, growth is fast. By July 1, most are in full bloom. When flowers die, little berry-like fruits form. Many birds consume them and spread them all over the landscape. That doesn’t mean you can. Don’t eat them. Furthermore, keep them away from pets. Leaves and stems contain toxins too. 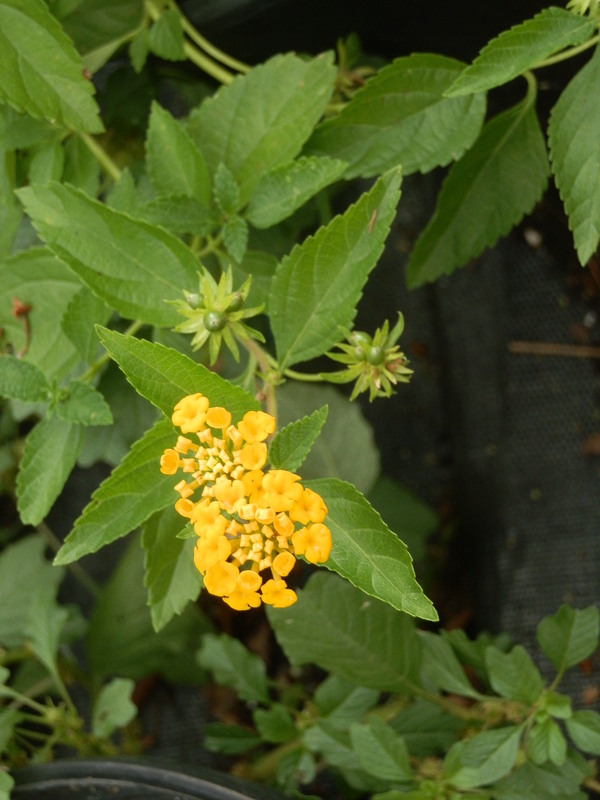 Many sources list lantana as a medicinal species, but it’s not one I recommend. Another heat loving and also poisonous species is oleander, sometimes called desert rose. This shrub thrives in hot sandy soils and even tolerates salt spray, so it does well at the beach. Unlike lantana, oleander remains evergreen and doesn’t die back to the ground each year. It has long narrow leaves. Large clusters of funnel-shaped flowers bloom most of the summer. Common colors are white, pink and red. Some cultivars can be maintained less than four feet tall while others are often at least three times that. Plants respond well to pruning. Don’t use these boughs as weenie sticks for your backyard barbecues. They are poisonous and could transfer toxins to foods. Leaves are especially toxic to most animals as are flowers, but all parts must be consumed to hurt you, so don’t freak out. 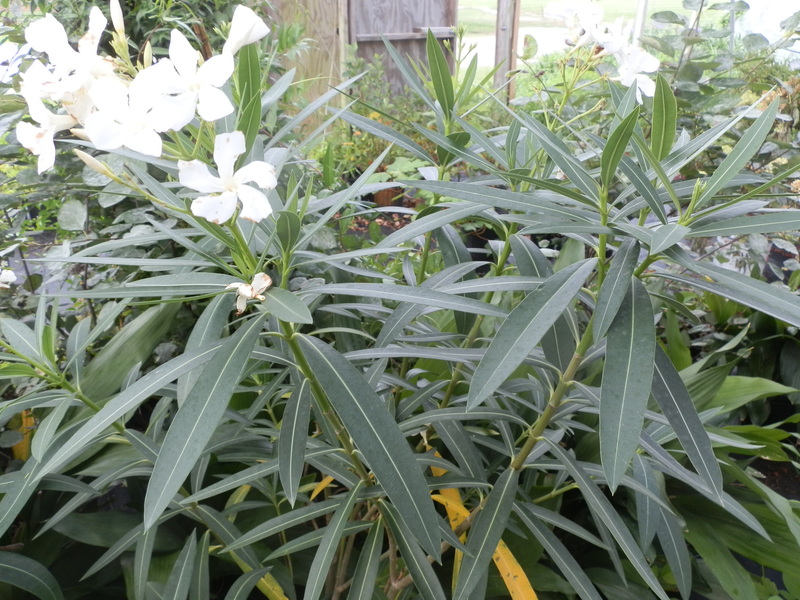 Considerable research is being conducted to use oleander to treat several types of cancer. In South Africa extracts are used to treat HIV. 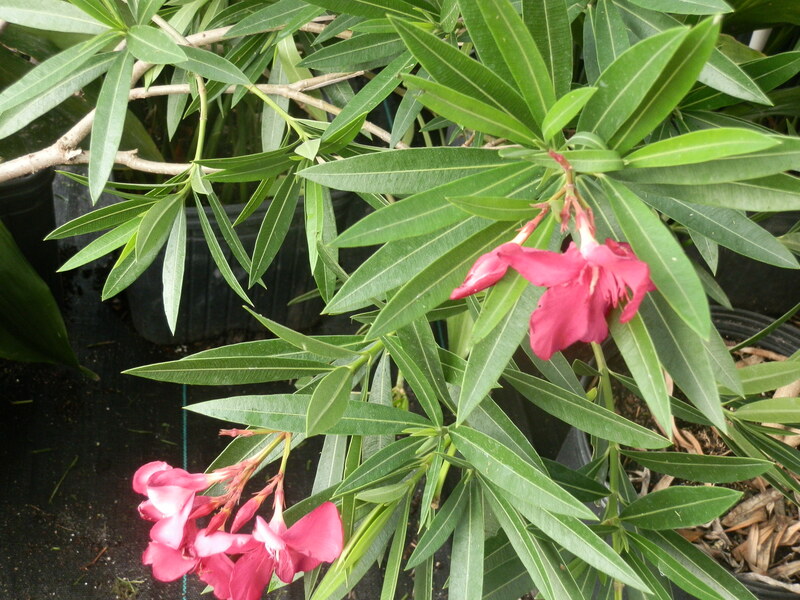 Epilepsy, skin disorders, heart problems and asthma are other problems addressed by oleander treatment. This is exciting research, but don’t play amateur pharmacist. Treating yourself with oleander could easily kill you. This entry was posted in Uncategorized and tagged heat loving plants, landscape plants, lantana, oleander, poisonous. Bookmark the permalink. This is such a beautiful plant. I would have never thought that the leaves and stems would have toxins in them. The lantana is a beautiful plant, but if its such a toxin to pets and humans why isnt it harmful to the birds? These plants can grow tall! They are really pretty. It is really cool that these plants attract butterflies and hummingbirds. When the flowers die and lantana grows berries that are poisonous why can only birds eat them ? I find this plant very interesting since it can grow really tall and sustain intense heat. i would have never thought that this plant could harm you. This is a really pretty flower and I nver knew it contained toxins. This is a very unique and pretty flower I never knew it contained dangerous toxins. I wouldnt of tought of a plant harming a human but i guess this one does,. When the flowers die and lantana grows berries that are poisonous why can only birds eat them ? Lantanas are one of the last perennials to break dormancy in spring.Once warm weather comes, growth is fast. By July 1, most are in full bloom.The common colors are white, pink and red. Some cultivars can be maintained less than four feet tall while others are often at least three times that. Plants respond well to pruning.Considerable research is being conducted to use oleander to treat several types of cancer. How do you maintain the height of plants? I didn’t know you could do that.